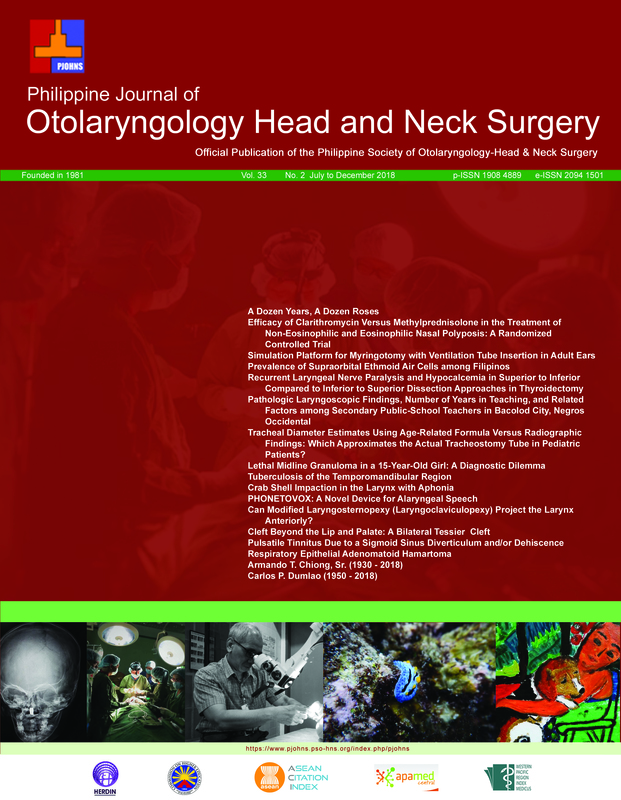 The Philippine Journal of Otolaryngology Head and Neck Surgery (PJOHNS), official refereed journal of the Philippine Society of Otolaryngology Head and Neck Surgery, is a free and open-access journal that follows the “Recommendations for the Conduct, Reporting, Editing, and Publication of Scholarly Work in Medical Journals” of the International Committee of Medical Journal Editors (www.icmje.org), and is listed as such: http://www.icmje.org/journals-following-the-icmje-recommendations/#P. Its academic editors are committed to fair and professional dealing in all aspects of our publishing operations. Our role is to publish original work of value to the intellectual community in the best possible form and to the highest possible standards. We expect similar standards from our reviewers and authors. Honesty, originality and fair dealing on the part of authors, and fairness, objectivity and confidentiality on the part of editors and reviewers are among the critical values that enable us to achieve our aim. The PJOHNS endorses and behaves in accordance with the codes of conduct and international standards established by the Committee on Publication Ethics guidelines https://publicationethics.org/resources/guidelines. It aims to provide local and overseas otolaryngologists, other surgeons and physicians, health and allied medical professionals, academicians and scientists from other disciplines, with a scholarly forum for the exchange of ideas and information in the discipline of otolaryngology - head and neck medicine and surgery and related fields that are especially relevant to health professionals in the Philippine and Asia Pacific context. It publishes peer-reviewed original articles (including clinical trials, laboratory investigations, effectiveness of diagnostic or therapeutic techniques); evidence-based medicine (including clinical practice guidelines, systematic reviews and meta-analyses, evaluations of current practices and commentaries); case reports with discussions; surgical and instrumentation innovations and illustrations of new techniques; review articles; imaging and histopathology cases; lectures and symposia; brief reports and abstracts; correspondence and guest editorials and studies relating to behavioral, epidemiological, educational or controversial issues in otolaryngology - head and neck medicine and surgery and related fields. We are particularly committed to publishing research and innovations for health that are relevant in low and middle-income countries. There are NO article processing charges or fees for submission, editing, review, and publication.